My name is Sath Nop, I am a golf professional and golf tour instructor in Atlanta, Georgia. I have over twenty years of golf playing and participated in numerous professional golf tours and PGA Monday qualifying events before becoming a teaching professional. I have learned to teach golf to all skill levels, from beginner to college player to touring professionals. I have learned from the Top 50 golf teachers in America, just to name few: (David Leadbetter Golf School, Mr. John Anselmo (Tiger Wood’s 1st coach that made him win 3 US Open as an amateur) and Mr. Steven Soule (Hank Haney’s director of golf instructor for the ESPN Golf School). I am also certified instructor for the "Accelerized Golf Teaching Method". This award winning teaching method has help some PGA Tour players Jason Bohn, Steven Bowditch, Boo Weekley, Kris Kurt, Scott Brown, Will Claxton, Nationwide Tour players Lee Williams and Reid Edstrom, and European Tour player Jamie Elson to win on the PGA TOUR, WEB.COM TOUR and EUROPEAN TOUR! Therefore, I have developed my own golf teaching technique “The 4 Step Golf Swing Mechanic” that I use to help a few student golfers to become golf professionals and to make their careers in the golf industry. One of my young 12 years old golfer students became a 0 handicap golfer after a short period of time with my teaching method. My teaching is so easy to understand and efficient that an average athlete person can become a professional golfer and compete at the PGA Tour level with only 6 months of intense golf lesson program that I have put in place at my SATH/NOP Golf Tour Academy in Atlanta Georgia. I am currently coaching a 2011 Nationwide Tour Player (now WEB.COM Tour), Mr. Jimmy Brandt and have two other mini tour professional golf player that are asking me to help them to get them to the PGA Tour Level as well. 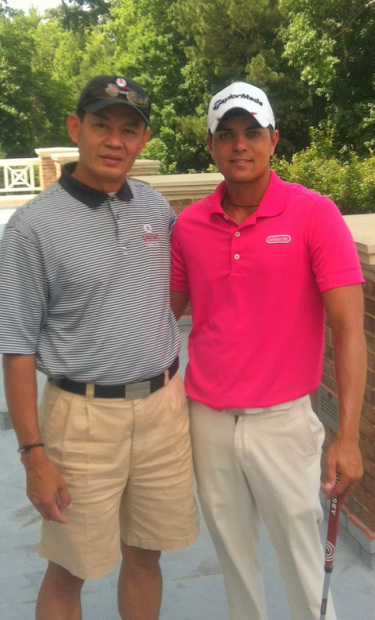 Me and my student Jimmy Brandt " Nationwide Tour Player" June-6-2012 Jimmy is the money leader 2012 on the "Peach State Professional Tour" and "Emerald Coast Professional Golf Tour"